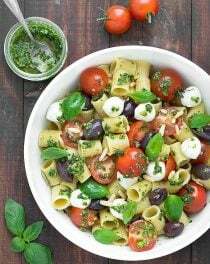 Summer pesto pasta salad is great for a quick and easy lunch or dinner, to take to parties, picnics or barbecues. It’s fresh, colorful and a real crowd pleaser. This pasta salad comes together in less than 15 minutes as you prepare the pesto while the pasta is cooking. Pesto is so easy to make: just pulse in the food processor a handful of ingredients and you have a tub that stores well for days in the fridge and compliments most dishes. If you don’t have fresh basil in your backyard and it’s too pricey at the store, try using arugula or kale. Choose a short shape pasta: half rigatoni, penne, farfalle (bow ties) , fusilli (corkscrews). You can also use two different shapes as long as they have the same cooking time. I usually do that when I have too many open boxes in my pantry and I want to finish them up. Feel free to use gluten-free, spelt or wholegrain pasta if you prefer. Cook the pasta 2 or 3 minutes less than package instructions, drain and rinse it under cold water then toss it with half tablespoon of extra virgin olive oil to keep it from sticking. You can also prepare the summer pesto pasta salad ahead of time and keep it in the fridge for a couple of days. Just make sure that you use more pesto than you think you’ll need, as the pasta will absorb a lot of the sauce as it cools, and can become dry. If it does get dryer, simply stir in a little more pesto, or drizzle some extra virgin olive oil to moisten it. Summer Pesto Pasta Salad: an easy pasta salad, filled with Mediterranean flavors and ready in under 15 minutes. A real crowd pleaser! Cook the pasta in a pot of boiling salted water, drain and reserve some of the water. Rinse the pasta under cold running water to stop the cooking process and toss it with half tablespoon of extra virgin olive oil. While the pasta is cooking, prepare the basil pesto. In a food processor, combine the basil leaves, garlic, pine nuts, salt and parmesan cheese. With the food processor running, slowly add the olive oil in a steady small stream. If the pesto is too thick for your liking, you can thin it out with a bit of the reserved water or more oil. When the pasta is cold, toss it with the pesto until evenly coated. 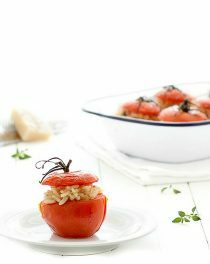 Add the olives, cherry tomatoes and mozzarella, sprinkle with pine nuts and garnish with basil leaves. 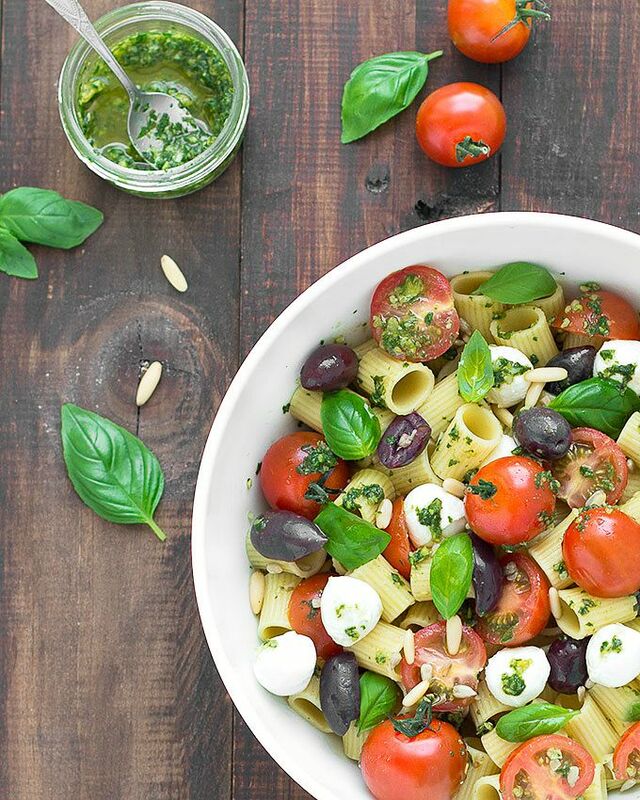 Enjoy this summer pesto pasta salad! 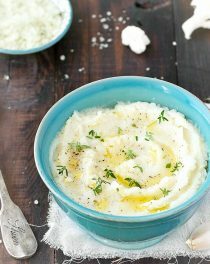 Really fantastic, super easy and quick recipe. Thanks for this beautiful, soothing and cooling recipe. This is a perfect Summer pasta dish and I love how fast it comes together. What a heavenly looking salad, Elena. I absolutely love the use of Olives in this recipe. There is so much beauty and delicious flavors in this salad – what a perfect way to enjoy the fresh tomatoes and herbs of summer! This IS so pretty Elena! I love the large pasta with the cherry tomatoes and pesto. A lovely, well balanced salad in color and flavor. The kalamata olives add another bit of mediterranean flavor. Nice! Thank you Diane! 🙂 I love kalamata olives, they have so much flavor! I love pesto Elena! 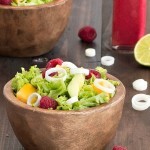 What a great summer salad that would be PERFECT at any BBQ! Great photos! Beautiful summer salad, love those balls for mozzarella. The colors are simply amazing! I love everything in this salad! This looks absolutely incredible – so many of my favourite summery flavours! Gorgeous photos too! OMG, that is the perfect summer salad. Gorgeous photos too! What a delicious summer salad! This would be great to take to a family gathering this summer, or to a BBQ. I love it! Love the colors of your salad. And it looks so fresh! Hi, if I’m making this with pesto I have already made, about how much pesto should I put with the pasta? Thanks!